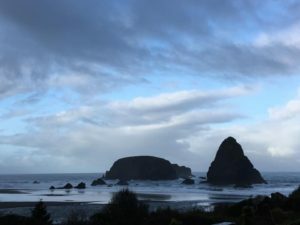 There are some significant gaps in terms of lodging and camping options along the southern Oregon coast. Creativity and/or high-mileage days will help you garner places to stay in this span. Here I’ll list your options, but with a heavy emphasis on what I did. That’s partly because I can only speak to what I have experienced myself, and partly because there aren’t that many other options. Please note that your needs and preferences may differ from mine for a variety of reasons. First of all, I was northbound, and therefore this was the first part of my journey on the Oregon Coast Trail. Seasoned southbound hikers would likely be able to hammer out more mileage, thus bridging some of the gaps in lodging. I also took some long rests in a few towns, which I personally benefited from, but you may not need. Your budget, time frame, daily mileage goals, fitness level, and a whole host of other factors will determine where you stay and how long you remain there. Read about considerations to keep in mind as you plan your OCT lodging. Jump to OCT South Coast Trail Data to figure out your daily mileage goals. I’ll list prices for the places I stayed so that you can get an idea of what you may expect to pay, but please note that: a.) I did the OCT in the spring, rather than during the height of summer tourist season, and b.) Prices are subject to change. Please only use this information I provided as a general reference, and do your own research as to current prices. Stay a little farther south, in Smith River, California, and walk (or bus/hitch) north from there. Since I didn’t want to miss a single inch of Oregon and wanted to actually walk across the border (and take a picture with the “Welcome to Oregon” sign), I decided to find a place in Smith River. I originally hoped to stay at Casa Rubio, 0.3 highway miles from the border. 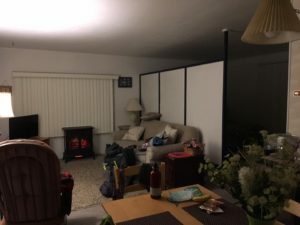 My friend and I ended up staying at Sea Escape Oceanfront Lodging, 1.6 miles south of the border ($108/night). I found this place on AirBnB. (NOTE: The motel does not list its name on AirBnB, and the address/location is incorrect so I initially THOUGHT this was Casa Rubio, and I was a bit disappointed to find that it was actually farther south.) When I realized my mistake, Casa Rubio was already booked, so I kept my reservation at Sea Escape. Sea Escape was fine; our room was cute and cozy, and we had a small kitchen area with a stovetop, refrigerator, microwave, sink, and dishes. The room had a slightly odd, musty smell, but we weren’t there long enough for that to be an issue, even for me (I’m like a canary in a coal mine with my asthma!). A big plus: We were able to just walk out the door the next morning and get down to the beach. These formations were beautiful but treacherous. We cut up to Highway 101 to circumvent this. However, after only about a mile, we had to cut up to Highway 101 because we ran into a big, rocky headland. Since the cliffs overlooking the beach in this area were all covered in private homes and vacation rentals, we had to climb someone’s staircase and cut through their yard to reach 101 (sorry!). This is another reason that I would have preferred to stay at Casa Rubio: It would have been more straightforward to walk into Oregon. It would have been an easy, short jaunt on the highway, or an easy, unimpeded beach walk, based on my Google Earth observations. Casa Rubio also has good reviews, but I can’t personally speak to what it’s like to stay there, of course. From a purely logistical standpoint, however, I would recommend Casa Rubio. How to get there: My friend and I took the Greyhound from Portland to Smith River ($98). After Medford, we left the official Greyhound bus and traveled the rest of the way on a local bus that collaborates with Greyhound (included in the $98 Greyhound ticket). Local buses on the coast are really laid-back, and we were able to request that the driver drop us off right in front of our motel. That was awesome! Read more about transit on the southern coast. Home sweet home, night one. A skunk visited us! My friend and I camped at Harris Beach State Park (pictured, top and right), on the north end of Brookings. This is a stunningly beautiful park featuring sea stacks, beaches, and coastal rainforest. Lodging options within the campground include: Hiker-Biker ($5, cannot reserve in advance), reservable campsites ($20 plus online transaction fees ), yurts ($43-$53, could be useful if you want to save pack weight and not bring a tent), and RV sites ($28-$30, could be useful if you have a support crew following you!). Since I began my trip during spring break for most Oregon schools, I didn’t want to risk not having a spot at the end of the day, and chose to reserve one of the $20 campsites online. The campground was pretty full, but the hiker-biker camps always seem to have spots available, so it was probably unnecessary to do that. I was glad for the peace of mind, though. One thing I’ll note is that my friend and I were careless about storing/hanging our food that night, and a skunk ate some of our oatmeal. When I tried to scare the skunk off, he was completely unimpressed. I retreated into the tent so I wouldn’t get sprayed. That was definitely our bad for being careless, but it does seem as though skunks are habituated there – based on our experience, as well as conversations I had along the trail. Please do your part by being diligent about how you store your food. This will be better for you, as well as for the next people who pass through the camp. Alternatively, you could choose to stay in Brookings. There are a lot of options in town. From a purely logistical perspective, I would recommend staying on the north end of town so that you do not have as much mileage to do the next day. There is only one official place you can stay the next day, and it’s about 9 hilly miles away from Harris Beach. When I was at the start of my trip and trying to get back into backpacking shape, that was a lot! There are two options in this area: One legal, and one illegal. One is expensive, one is free (unless you get caught). 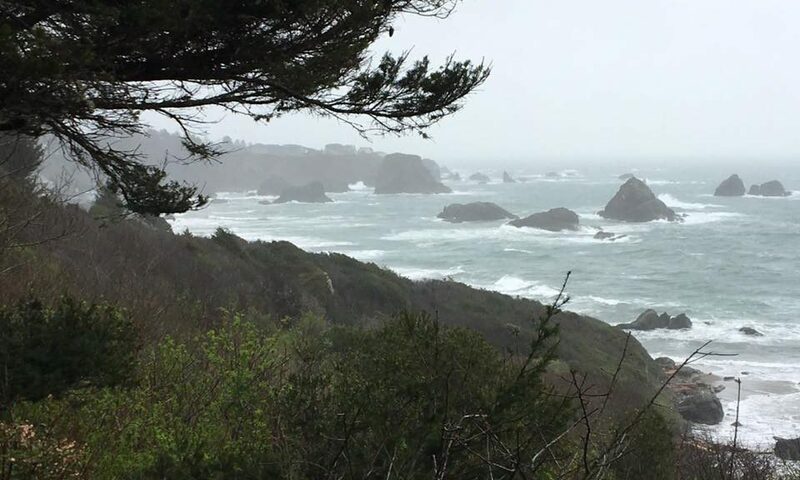 There isn’t a place to stay other than Whaleshead for the 16.9 highway miles (20 or more trail miles) between Harris Beach State Park and the campground at Pistol River. This nice, open, flat, grassy area would hypothetically be a good (albeit illegal) campsite. Illegal Option: The alternative in this area is “stealth camping.” Note that the entire Samuel H. Boardman State Scenic Corridor is officially day-use only. It is illegal to camp. If you DO follow through on this, DO NOT blame me if you get caught. DO be aware of the consequences. Most importantly, DO NOT TRASH THIS BEAUTIFUL PLACE. 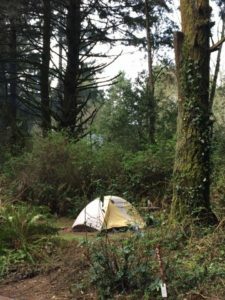 Put the “stealth” in “stealth camping” and make sure that you practice Leave No Trace techniques to a “T.” If you are unfamiliar with LNT, read more here. I would hypothetically consider the day-use area at Whaleshead, which is nearly directly across the highway from the Whaleshead RV Resort, to be a good spot for some “stealth camping.” The OCT emerges from the forest into a lovely, shaded, grassy, flat area that is set back from an outhouse and a parking lot far enough that one would have some privacy if one were to set up a small tent there. This spot is right next to Whaleshead Creek, which we did pump some water from as we passed through. This area seemed quiet at night (it’s officially day-use only and is down a steep, gravel road that seems to discourage many from driving down), and would be really beautiful, hypothetically, to wake up to. There are some picnic tables in the vicinity, too. Again, this is NOT LEGAL to do. I’m simply stating that if a hiker was hypothetically desperate for a place to sleep, and didn’t want to pay an absurd amount for a cabin, this seems like a good, safe spot for a hypothetical camp. And again, if you ever are to do this, please practice Leave No Trace – in fact, you ALWAYS should when you camp, no matter where you are! A seasoned hiker could blast through this area in one day, but 9 miles of ups and downs in brutal weather was enough for my friend and me on Day 2. By the trip’s end, I probably could have done Boardman in one go, but certainly not at the start! 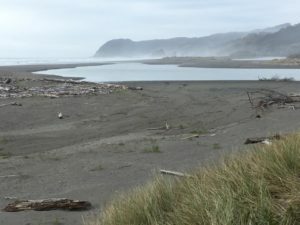 Looking north from Pistol River State Park, towards the river itself, and Gold Beach Beyond. There is no evidence of this campground online, but there IS one at Pistol River State Scenic Viewpoint. It’s across Highway 101, away from the ocean. My friend and I didn’t stay there, but we saw the signs for it! Logistically, I think this would be the best option for the pace/mileage we were doing. What I would envision is hiking from Whaleshead to Arch Rock Viewpoint (about 10 trail miles) and then getting a ride to Pistol River (otherwise you have a lot of highway walking ahead of you). This would put you in place to hike about 15 miles into the town of Gold Beach the next day. Alternatively, there is a spot called Secret Beach near the Arch Rock Viewpoint in the Samuel H. Boardman State Scenic Corridor. Word is that it has been used for camping before. I would be cautious about using this spot, though, especially in the spring and fall, when waves are driven higher by storms. During the time I was doing the OCT, that would not have worked out. Also, please note, again, that Boardman is OFFICIALLY day-use only. Camping there is illegal, but hypothetically could be done with discretion. I suppose one could also hypothetically camp at the Arch Rock Viewpoint. There is a relatively large, forested area a little ways off the highway where one could pitch a tent. There is an outhouse and there are picnic tables. Just note that, again, this would be illegal, and that this is a very popular tourist stop, so you would need to arrive late and leave early to avoid detection. And again, if you are to “stealth camp,” then BE STEALTHY and LEAVE NO TRACE. Review LNT principles here. Another option would be to get a ride at the end of the day from Arch Rock to the town of Gold Beach. The next day, you would have to backtrack to the Pistol River to complete the 15 miles of the OCT between Pistol and Gold Beach, but that would be easy enough to do by bus or hitching. See the entry below for my Gold Beach recommendations. 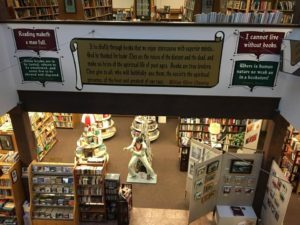 The view from the second floor of Gold Beach Books. Gold Beach is an adorable town, and a great place to spend a day or two resting and resupplying. There are two grocery stores, McKay’s Market and Ray’s Food Place; an Ace Hardware Store, where I bought a really nice knife after realizing I forgot to pack mine; a laundromat; some delicious restaurants; Gold Beach Books, an awesome bookstore that offers free shipping (useful when you want to buy everything they have but don’t want to fill your pack with books); and quite a lot of options for places to stay. My friend and I stayed at the Pacific Reef Hotel ($75/night), which I would highly recommend. The room we shared was basic but spacious, clean, and comfortable. We had a microwave and a mini fridge. The staff were really friendly and helpful. They have an outdoor movie screen where they show a video about the southern Oregon coast each night (free), and at least when we were there, they also screened the adorable Pixar short “Lava,” which I recommend watching right now. Pacific Reef also has a relationship with the Chowder House, which is literally next door. Guests at Pacific Reef are given a coupon for a free cup of delicious chowder, which was one of the most satisfying things ever after a few days of hard, rainy hiking! 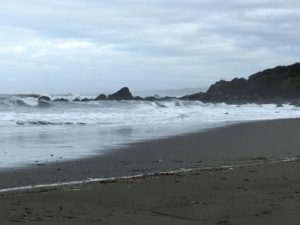 There are quite a few other hotels and motels in Gold Beach, as well as some hotels and motels on the other side of the Rogue River in Wedderburn. 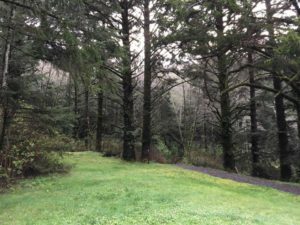 There are also two camping options on the border of Gold Beach: Indian Creek RV Park (which DOES have tent camping), and Quosotana Campground, managed by the US Forest Service (first-come, first-served, 15 miles outside of Gold Beach).